Korea has no shortage of markets, which is a wonderful thing for me as getting lost in a land of vendors, smells and goods is one of my favorite things to do abroad. You can learn a lot about a country or a region from their markets. They directly reflect their society. What they sell, how they present it, etiquette, customs, hours, all give a concentrated insight. Like a trailer to a movie, markets are the sneak preview to the greater picture of a culture. Coming off the heels of India, Korea’s markets are strikingly different. The markets of India were full of vibrant colors, distinct, potent smells of cumin and magnolias, and packed with aggressive, quick-moving vendors. Korean markets are filled with the briny scent of the ocean lingering in the air, food courts, and calm crowds perusing everything from produce to home goods to traditional fabrics and everyday wear. Large, clean, and organized rows house relaxed proprietors. Inside the markets is where I realized how small and surrounded by water Korea really is. 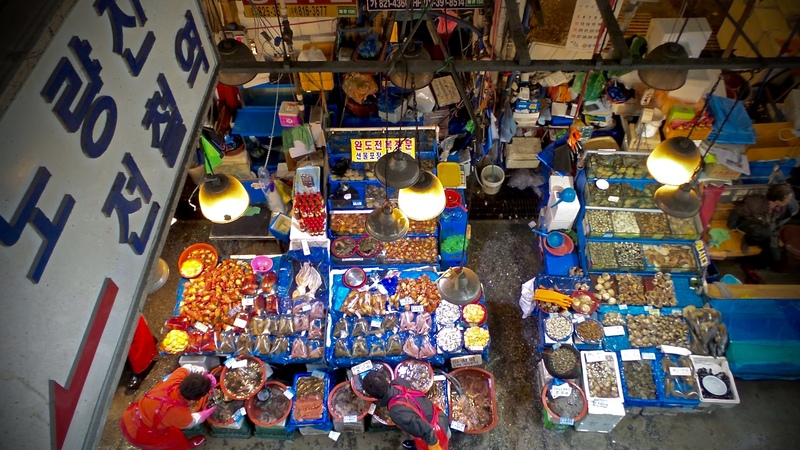 Every market boasts huge sections dedicated to ocean life leaving no creature of the sea spared. Kimchi, a staple side of each and every meal, fill stalls that beam glowing shades of red, row after row, with the dense, potent smell of fermentation. Pockets of food courts hum with sizzling pots and hungry market goers washing down made to order snacks with sojus and makgeollis. Produce is abundant with heaps of vegetables heavily represented by arrays of greens and heaps of mushrooms, radish, and garlic. Piles of dark, dried seaweed run into barrels of rice, barley, and buckwheat. Ginseng and teas round out the edges. The smells are distinct from section to section; sweet, malty aromas of grains rising from huge buckets, earthiness of fresh vegetables laid out in monochrome display, and the unmistakable, attention demanding smells of the sea. The sounds of fish tanks running, pots clanking, and soft echos of shoppers that bounce off the high ceilings fill the open air. Though busy, the calm nature of the markets allow for thorough inspection of the tiniest, dried fish, and strange foods being cooked. Korean markets are a world to get lost in.